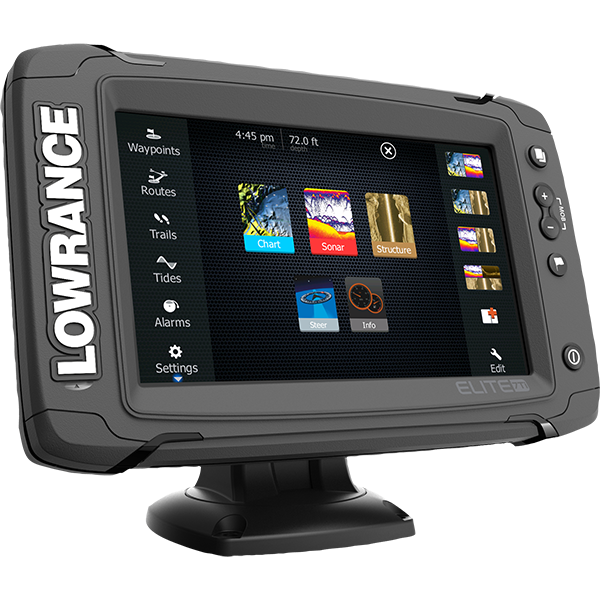 The Lowrance® Elite-7Ti is a touchscreen fishfinder/chartplotter that matches high-end functions and features with powerful performance ─ all at an affordable price. Sporting a seven-inch, high-resolution touchscreen display, the Elite-7 Ti has your sonar needs covered with StructureScan® HD compatibility and support for Low/Mid/High CHIRP and 83/200 /455/800kHz frequencies. It has a built-in GPS antenna and reliable Lowrance navigation technology, allowing you to navigate with ease. The Elite-7 Ti also features integrated Bluetooth® and wireless connectivity that not only allows you to download software updates directly to the unit, but gives you the capability to download Insight Genesis custom maps to the unit ─ for immediate use ─ directly from the water.